SBI Notification is out. SBI is recruiting for 38 Specialist Cadre Govt Job Posts. 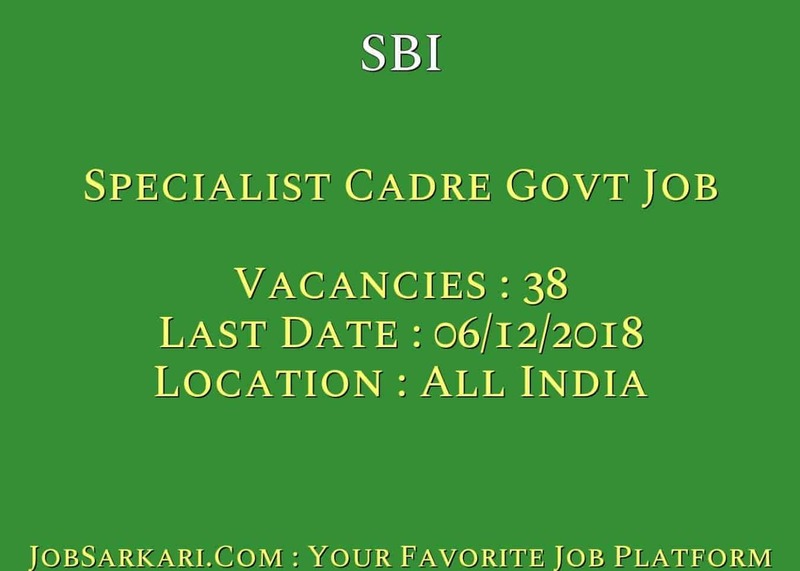 You can check SBI - State Bank of India last date, download SBI notification, visit SBI official website and check other SBI Vacancy details.Complete Vacancy and recruitment Details about 38 Specialist Cadre Govt Job vacancies in SBI are provided below by JobSarkari.Com only for you. Last Date for Apply Online 06/12/2018. SC / ST / PH Rs.100/-. (Sector Specialist) Candidate Must Have Passed B.E/ B.Tech And MBA (Finance)/ CA/ CFA With 60% Marks With 10 Years of Experience in Related Field. Between 35 to 45 Years. 03. (Structuring & Syndication) Candidate Must Have Passed B.E/ B.Tech And MBA (Finance)/ CA/ CFA With 10 Years Experience in Banks & Financial Institutions. Between 35 to 45 Years. 02. (Sector Specialist) Candidate Must Have Passed B.E/ B.Tech And MBA (Finance)/ CA/ CFA With 60% Marks and 08 Years Experience in Related Field. Between 30 to 40 Years. 07. (Sector Specialist) Candidate Must Have Passed B.E/ B.Tech And MBA (Finance)/ CA/ CFA With 60% Marks and 05 Years Experience in Related Field. Between 25 to 35 Years. 11. (Structuring & Syndication) Candidate Must Have Passed B.E/ B.Tech And MBA (Finance)/ CA/ CFA With 60% Marks and 05 Years Experience in Related Field. Between 25 to 35 Years. 04. (Digital Marketing) Candidate Must Have Passed Graduate in Computer Engineering / BCA / MCA / Post Graduate / MBA With 08 Years Experience in Digital Marketing. Between 30 to 40 Years. 01. (Media Strategy & Operations) Candidate Must Have Passed Post Graduate in Statistics or MBA (Marketing) With 08 Years Experience in Media Strategy. Between 30 to 40 Years. 01. (Marcom) Candidate Must Have Passed Graduate Degree in Any Stream With MBA in Marketing and Having 03 Years Experience in Marketing & Communication. Between 21 to 32 Years. 01. (Corporate Communications) Candidate Must Have Passed MBA / Post Graduate With 03 Years of Experience in Related Trade. Between 25 to 32 Years. 01. (Events & Sponsorships) Candidate Must Have Passed Graduation With 05 Years Experience in Relevant Field. Between 26 to 35 Years. 01. Candidate Must Have Passed Ph.D in HR, Organisational Behaviour, Strategy With 05 Years Experience of Teaching in Institution Such as IIMs, NIBM. Between 28 to 55 Years. 03..
Hyderabad (Marketing) Candidate Must Have Passed MBA in Marketing/ Product Development or PG Diploma in Marketing & Related Field With 05 Years Experience of Teaching in Institute Such as IIMs and NIBM. Between 28 to 55 Years. 01. (Credit/Risk Management/International Banking) Candidate Must Have Passed Post Graduate in Banking & Finance With 05 Years Experience of Teaching in Reputed Institutions. Between 28 to 55 Years. 01. SBIL Kolkata Candidate Must Have Passed MBA / Post Graduate Diploma in Management and Graduation From Indian/ International ‘B’ Schools With 05 Years Experience in Marketing. Between 30 to 50 Years. 01. Total No of Post 38. 6.Online Application Can be Submitted on or Before 06th December 2018. Q. What is the Last Date For SBI Specialist Cadre Govt Job Vacancy ? A. 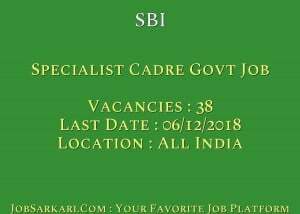 Last Date for SBI Specialist Cadre Govt Job Posts is 06/12/2018. Q. What is the Form Type of SBI Specialist Cadre Govt Job Recruitment ? A. The Form Type for SBI Specialist Cadre Govt Job Posts is Online. Q. How many vacancies are available in State Bank of India Specialist Cadre Govt Job Posts ? A. There are about 38 Vacancies in State Bank of India Specialist Cadre Govt Job Posts. Q. What is the Full Form of SBI ? A. Full Form of SBI is State Bank of India .